Kia ora and haere mai, welcome to the 34th instalment of 9mm for 2018, and the 206th overall edition of our long-running author interview series. 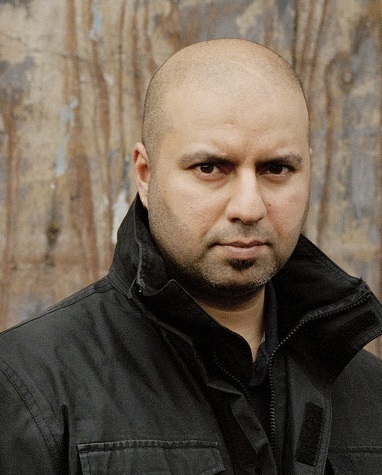 Today I'm very pleased to welcome Amer Anwar, a London author whose debut novel centred on an ex-con working a dead-end job who gets caught up looking for a missing girl impressed many people in publishing but had a long journey to its eventual release last month. Amer, who won the CWA Debut Dagger several years ago for the beginnings of what would become BROTHERS IN BLOOD, has spoken in interviews about facing cultural bias and the difficulties in breaking through with a tale that don't neatly match a narrow view of what readers may enjoy (based on what has succeeded and sold in the past): "There was all this stuff about diversity in publishing at the time …and it was just sort of given lip service really. I was thinking, there is a diverse book, it’s won an award and you all think it’s well written and yet it’s still not getting published... It was always first and foremost a crime thriller. It just happens to have Asian characters and it’s set in an Asian area of London and there’s a lot of Asian influences, but the main thing is it’s a crime thriller." I remember reading about Amer winning the Debut Dagger years ago, when I was just starting out with this blog, and thinking 'Western Fringes' (as it was entitled then) sounded like a fascinating story. I'm glad that after years of work and staying true to himself, including a dip into self-publishing, that a broad audience are now getting a chance to read Amer's full novel. You can read a bit more about Amer's decade-long journey from Dagger to Dialogue Books (an imprint of Little, Brown), in this piece he wrote for the Crime Writers Association website. Amer is a west London native, who's had a writer's resume of eclectic jobs, ranging from warehouse assistant to a driver for emergency doctors to chalet rep in the French Alps. He worked for a decade producing creative artwork and graphic design for the entertainment industry, and earned an MA in Creative Writing from Birkbeck, University of London. But for now, Amer Anwar becomes the latest criminal mind to stare down the barrel of 9mm. Well, not really a hero per se, or a detective, more of an anti-hero, my favourite recurring character in crime fiction would have to be the professional armed robber, Parker, from the series of novels by Richard Stark. The books are brilliantly written, lean and mean, just like Parker. Violence is a means to an end for him and he doesn't hold back when he needs to use it. There were 15 books in the original run and then Stark stopped – only to bring the character back after a break of 23 years. The later novels were just as good and Parker just as effective in the 1990s as he'd been in the 1970s. The very first book I remember reading and really loving was an abridged children's version of The Count of Monte Cristo. It was told in a really simple style but with all the best bits. Why wouldn't I have loved that? Dastardly villains, a hero wrongly imprisoned, a fantastic prison escape, fabulous treasure and sweet revenge. I never knew a book could be so exciting. It'd been cut down to about 100 pages and I think I read the whole thing in one night. That must be the book that got me into crime and thrillers. Next day, I went straight back to the school library and took out another book, I think it was The Colditz Story. 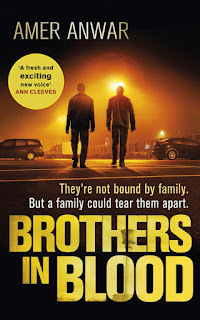 Before my debut crime novel, Brothers in Blood, I'd only ever written a few short stories as part of various writing courses I'd done. I actually wrote the first chapter as part of a writing course. It was my first ever attempt at a novel and I was pretty happy with the first chapter, so I entered it into the CWA Debut Dagger competition, (under its original title, Western Fringes) really just expecting to receive my very first rejection on the road to publication. I only ended up winning the bloody thing! That led to me signing with a literary agent. I then had to finish the book, which took about 8 years, mainly because I'd never written a novel before and so had to learn as I went along. Once the book was finally finished it went out on submission – only to be rejected by about 30 publishers. They all said it was really good, they just didn't feel they could publish it. I eventually self-published it and started getting great reviews. Then I had a chance meeting with a publisher, sent her the book and within a few days had signed a two book deal. A: Reading, obviously. I buy way more books than I can read. Last time I worked it out, it'd take me over 10 years to read all the books I have TBR – and I've bought even more since then. But then, there's no such thing as too many books, just not enough time. Aside from reading, I love watching movies and good TV shows, listening to a wide range of music, going out with my friends and spending time with my daughter, who's 7. A: I live in London, which is about as touristy as anywhere in the world. You could head west to Southall, which is the setting for Brothers in Blood and find really good, authentic Indian food, or come and watch the celebrations during Diwali. Otherwise, I'd suggest coming to London in September and taking part in the Open House weekend. It's when lots of building that are normally closed to the public open their doors and allow you to look around. I've been a couple of times and it's fantastic – I went inside the Treasury building, the Foreign Office, the Houses of Parliament and into Portcullis House, where the MPs have their offices. I also went inside Wellington Arch at Hyde Park Corner – which houses what was once London's smallest police station inside – and climbed to the top and out where the statues are. Loads of building all over the city take part. It's brilliant and I'd really recommend it. That's a hard one … I guess maybe Riz Ahmed. I'd have to say Brothers in Blood, as it's my first, and so far only, novel and my first to be published, so very special. Either that, or the one I'm currently working on, which is a follow up to Brothers in Blood. My initial reaction when I found out I finally had a publishing deal would be best described as one of contained excitement, mainly because I didn't have anyone to tell straight away. A few days later though, one of my best friends was visiting from Dubai, where he works and we went out for a drink. When we got to the pub I suggested we start with a bottle of Champagne. He asked if I was mad, so we settled for beers instead and I didn't tell him straight away. Then, towards the end of the evening, I went to the bar to get the next round in and got a bottle of Champagne. "What the hell's with the Champagne?" he asked me. That's when I told him. He was over the moon and we toasted and drank the bubbly. Then he went to get the next round in – and came back with another bottle! It was almost closing time by this point, and we made very short work of it. Let's just say it was a very merry celebration! Being a debut author, I haven't done all that many signings and events but on thing that has kind of stuck in my mind took place just after the New Crimes panel I was part of at Blood Scotland. The panel had just finished and the audience were starting to leave, when a white Scottish lady came up to me and said how much she'd enjoyed my reading a section of the book. She said she particularly liked the fact the there was some Punjabi in it, as she'd never heard it in a book before. I was very impressed that she even knew it was Punjabi – at which point she began speaking to me in perfect Punjabi! It was a lovely, surprise. I just wish I'd had a chance to ask her how she'd learned to speak it so well. Thank you Amer, we appreciate you chatting to Crime Watch. You can read more about Amer and his writing at his website, and follow him on Twitter.